Look at those shoulders! Just look at them! The shoulders are the only part of this coat I just don't like. Maybe someday I'll update the coat to some 1840s sleeves instead of the earlier poofs that it has now. 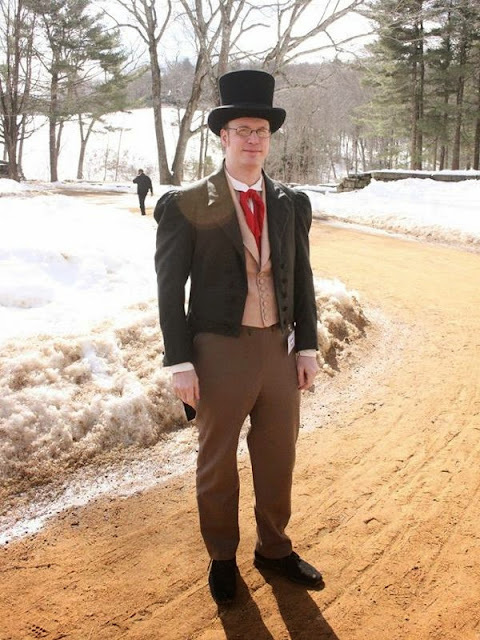 Here's a photo from when I wore the outfit to Old Sturbridge Village. 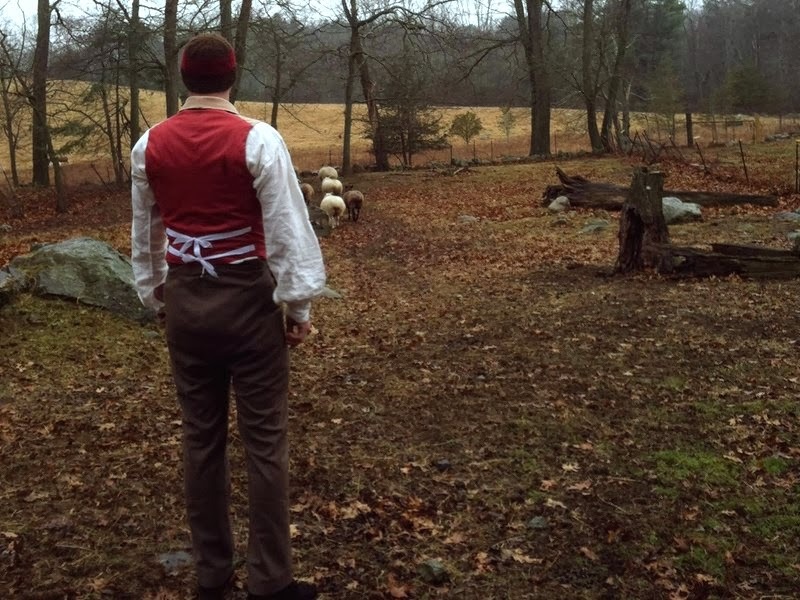 As I recall the weather was warm and the snow was melting to make a lot of mud. But at least I was warm enough in my outfit. The hat is shaped wrong for the period, but it'll have to do. 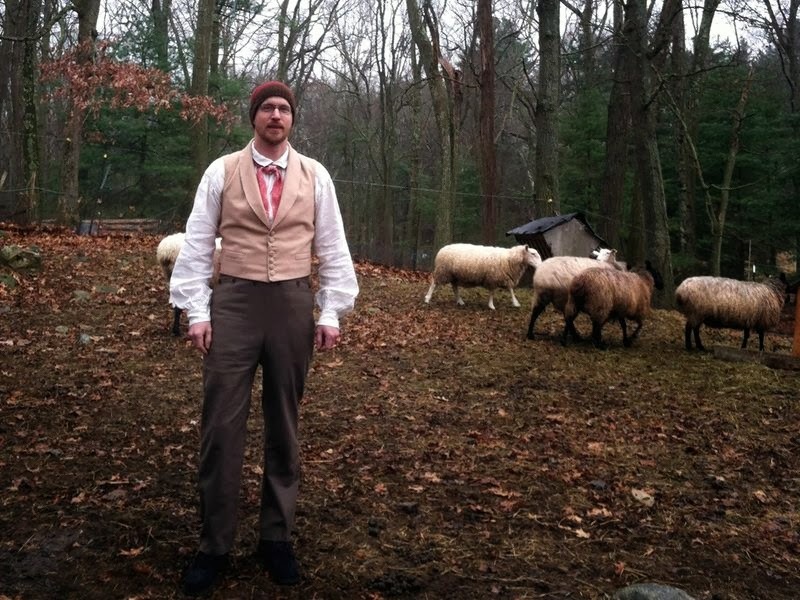 If this were the 1830s I'd be clean-shaven. 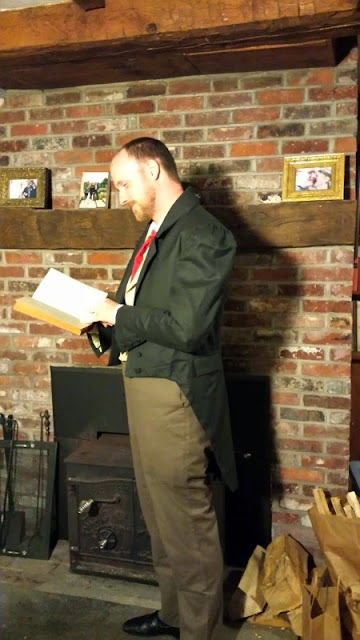 It's been an awfully long time since I've posted. It was built in 1738. I actually finished the 1830s coat and went to the Old Sturbridge Village dinner wearing it, but basically as soon as I finished we bought the house and then I was immersed in home improvement projects. 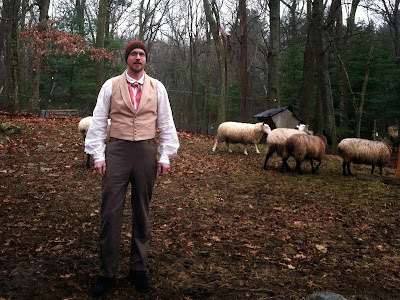 I kept thinking, "I have to post to my blog" but then projects took over. 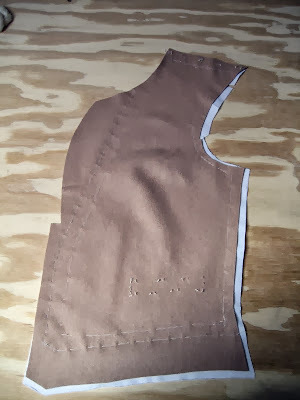 That's not entirely true, because I've done a few other tailoring projects since then, but I somehow kept getting distracted from posting to my blog. And I apologize. 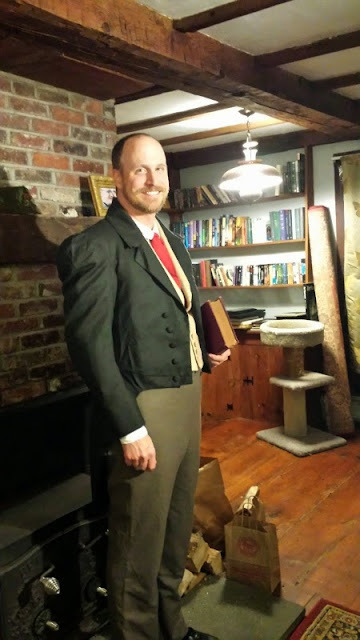 Here are the details on finishing the coat, and I'll post photos of the finished result next. Sooner than 8 months, I promise. 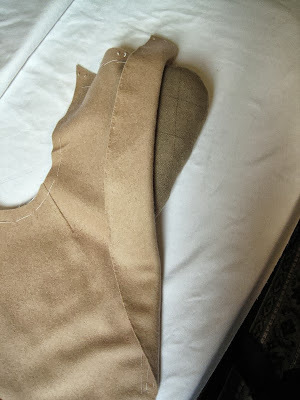 Anyway, after doing my fitting with basted seams I ripped the whole coat apart and started sewing it together for real. Obviously everything is hand-sewn - all seams are back stitched, and most everything else is felled or catch-stitched. As always, you can click on the images for a larger view. 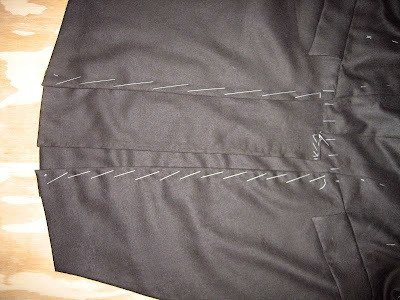 The skirts are pleated into tails. 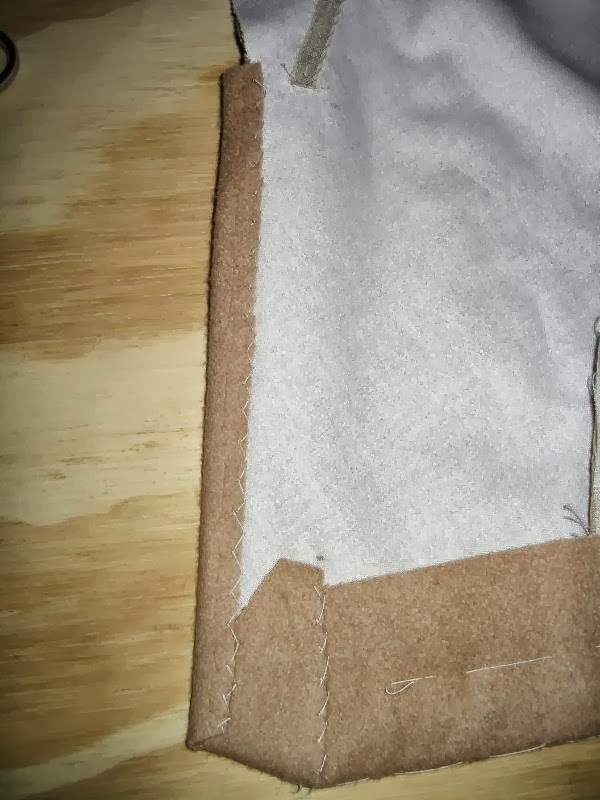 The collar canvas is basted to the cloth before being padded. The collar and revers. 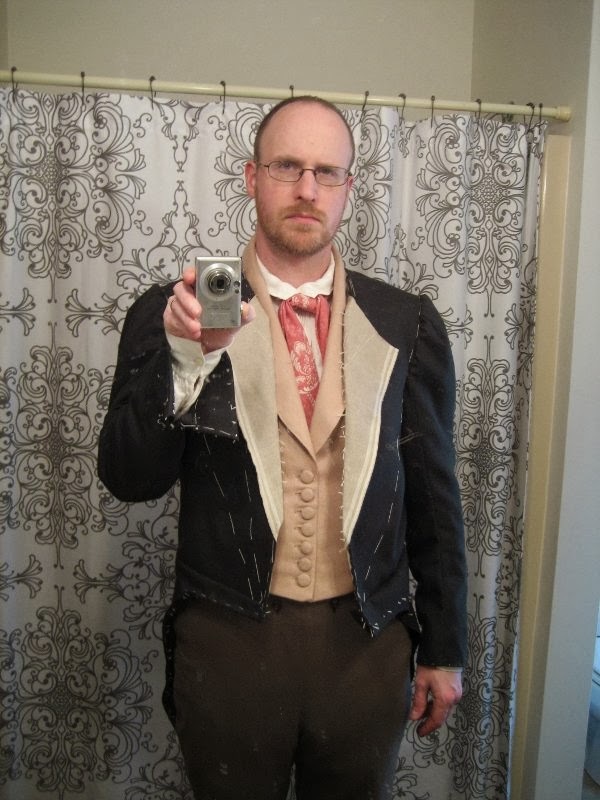 I'm not sure why the left lapel is so wrinkled. It really isn't that bad when I'm wearing it. The sleeves. 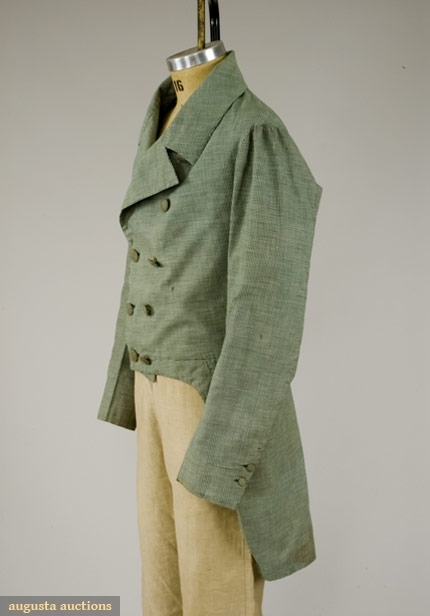 The 1830s coat has funky, floppy cuffs. And giant poofy sleeve heads. I really don't like the style, but I'm a slave to fashion. 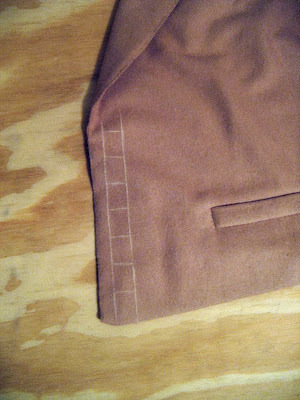 The sleeve linings. 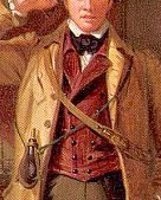 Obviously the cuffs have working buttons (i.e. 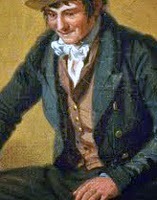 "surgeon's cuffs"). 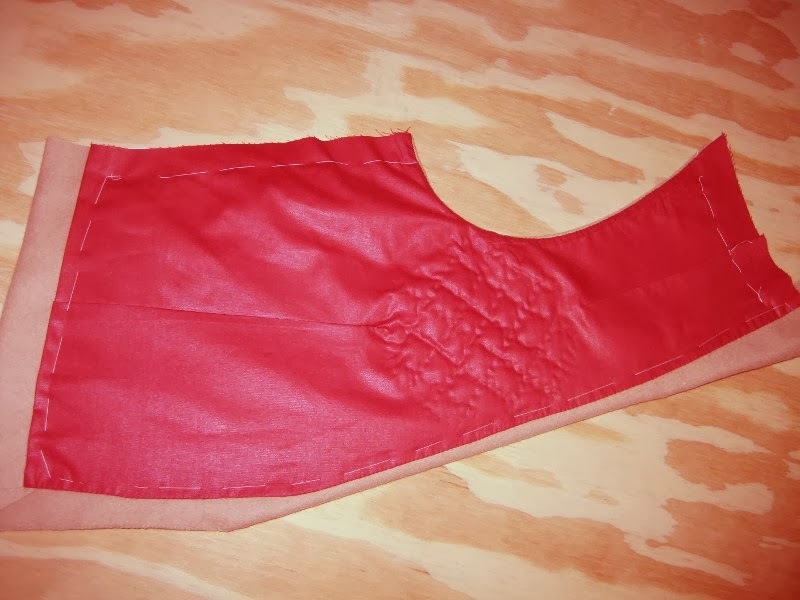 The outside of the cuffs. Floppy, floppy. 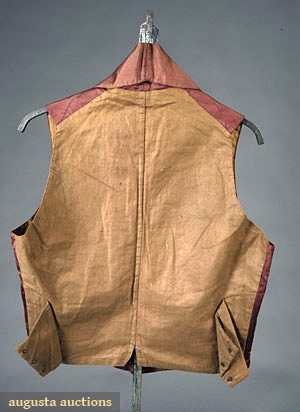 Don't let the name "dress coat" fool you here - although it was certainly a coat for wearing to fancy occasions (and has today become the standard for white collar wear), this tail coat shows up in William Sidney Mount's work tattered and full of holes as well. 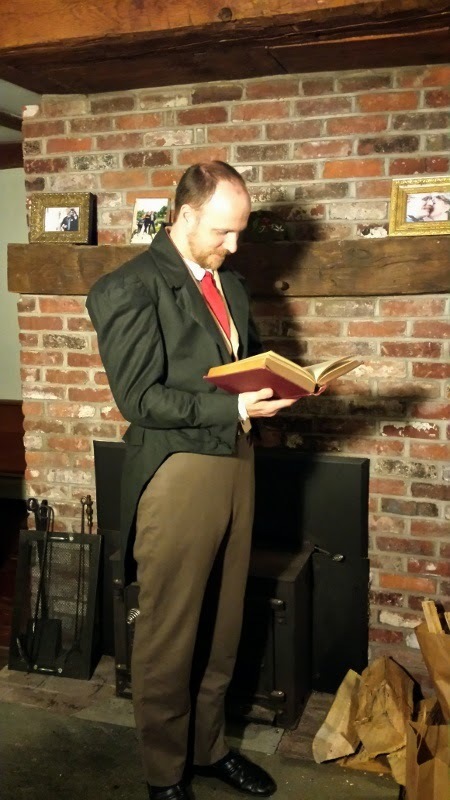 It was pretty much the only alternative to a frock coat. 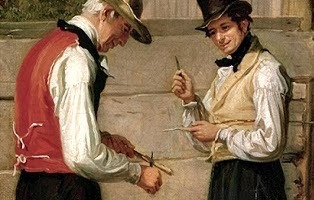 Short jackets were less common. 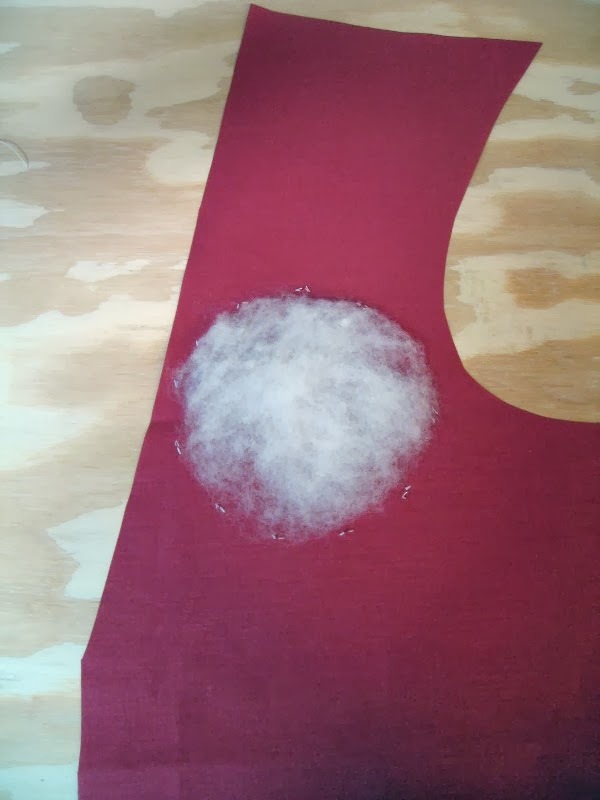 The one I'm making is single-breasted, which means that it doesn't actually button in front. 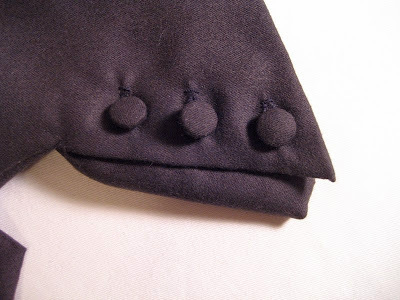 It will have buttons and fake buttonholes. 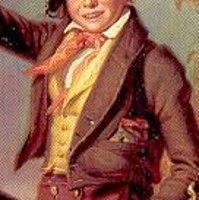 I chose a design from around 1830, instead of closer to 1840. 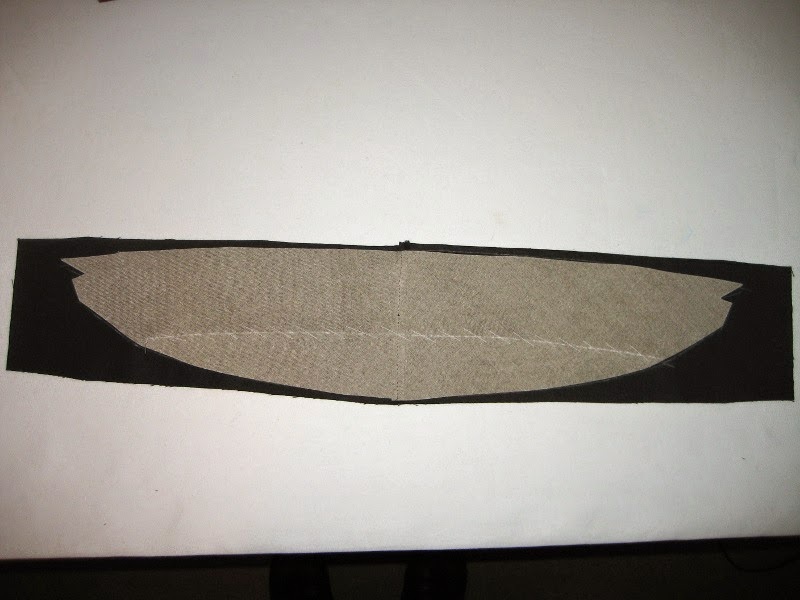 This means that it doesn't have a separate side panel, but instead the front and side are cut as one. I haven't decided yet if I want side pockets, but I've cut some pocket flaps just in case. 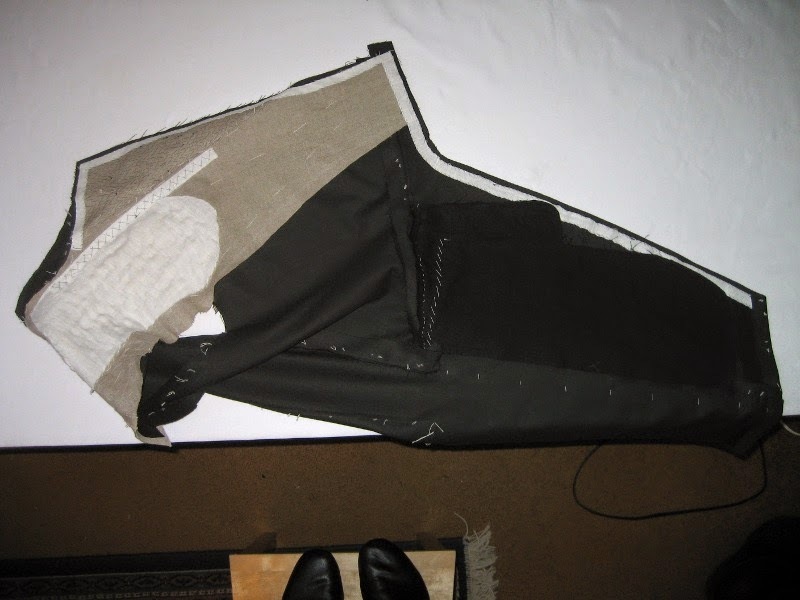 Then the canvas was basted into the fronts. You can see at the shoulder seam how the canvas is already shaping the coat. 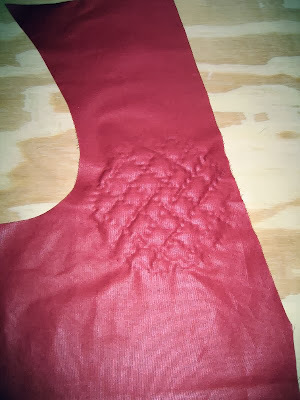 It looks as though the basting wrinkled the coat, but it isn't really that bad. The camera flash really brought out the worst of it. Don't I look grumpy? This is the skeleton baste: everything is only basted together, with no lining or collar. 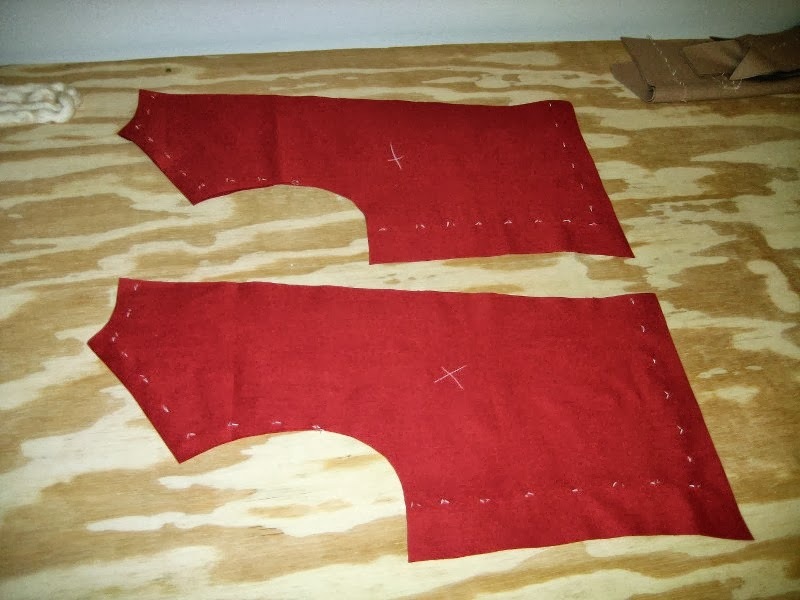 The sleeves aren't set right - they need to turn forward a bit, and I don't like the puffiness at the sleeve heads. I may have to do some serious gathering. Anyway, I made lots of chalk marks. 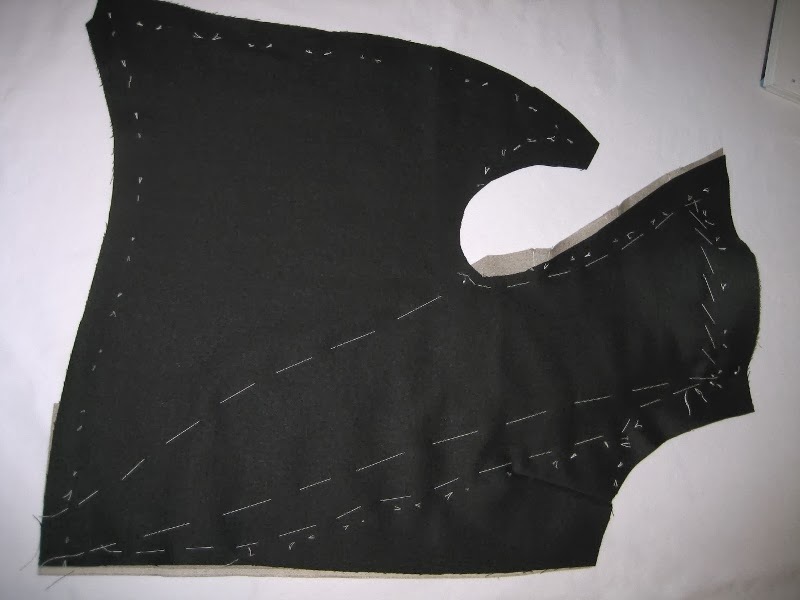 The diagonal slashes at the waist are where I want to shrink out some fullness, and the armscye is going to be drawn in below the right shoulder. It's been far too long since I've posted - sorry! 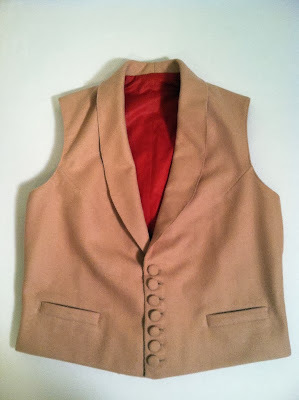 A couple big projects took up most of my time, but now I'm back, and the vest is finished. 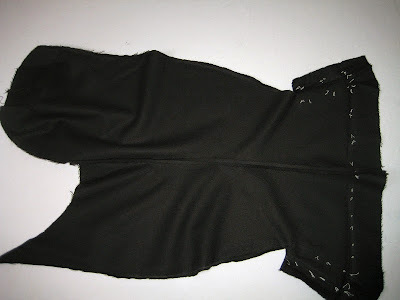 And the back looks like this. Also, now I've basted the front armscye of the cloth and lining together. The lining is turned in and prick stitched to the fronts. 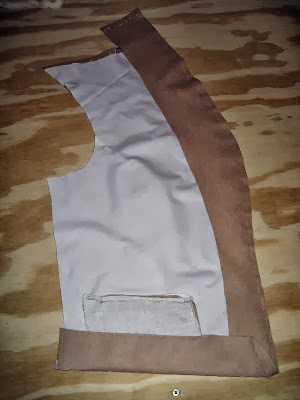 A pleat is placed into the lining. If the quilting weren't there the pleat would run the full length of the vest, but now it tapers in and out of the quilting above and below. 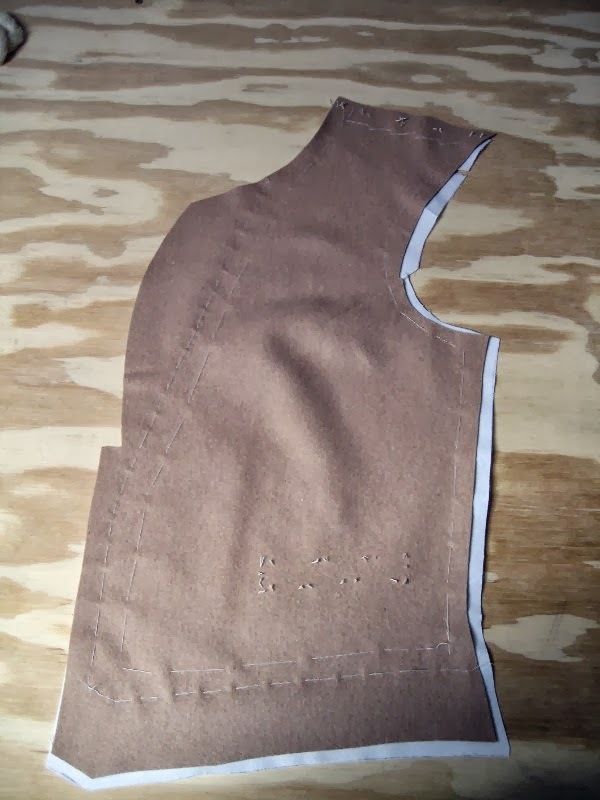 This pleat allows the vest to curve around my body without pulling at the lining. I've also felled the lining to the facing. 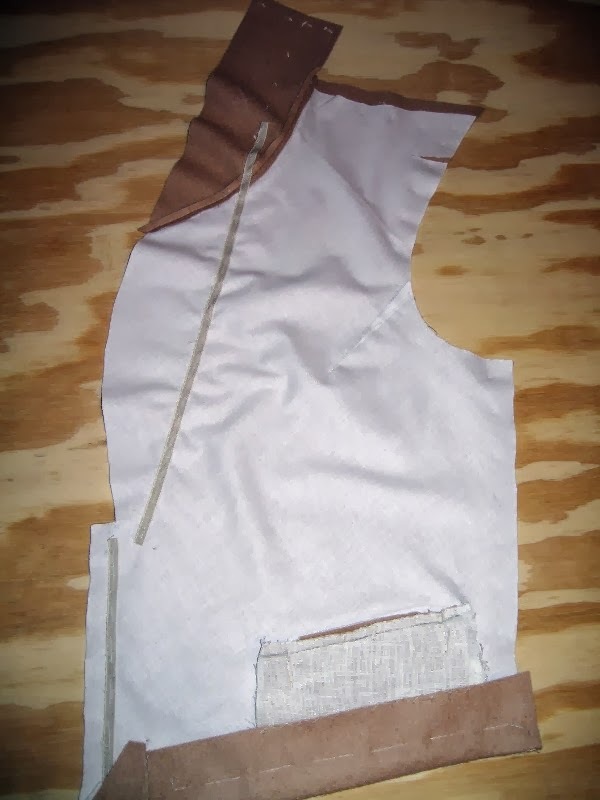 Before attaching the backs, I basted some scraps of linen into them where I'll attach the back stays. 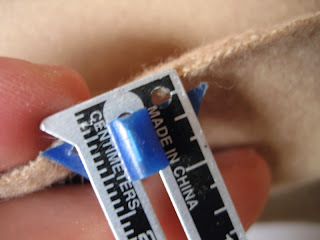 This will help keep the stitches from pulling through the fabric. 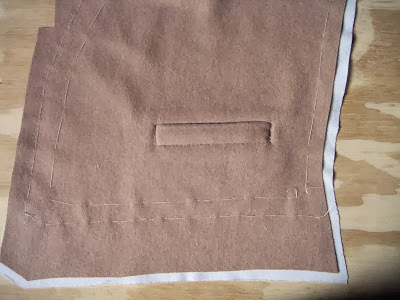 The back is attached (sorry, no photos of the process), and buttonholes are marked. Somehow I ended up with 7 buttonholes. I didn't really mean to, but that's all right - they all fit. Finished buttons and buttonholes. 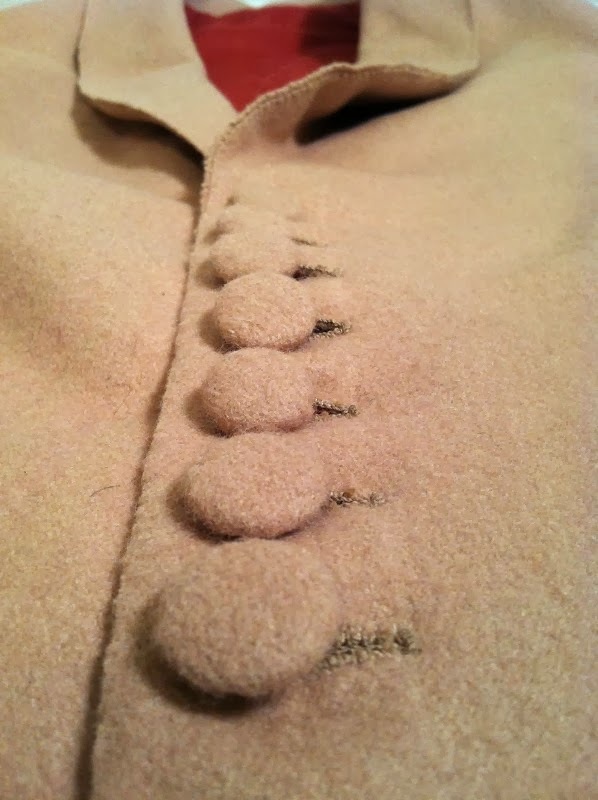 The buttons are self-covered wooden blanks from Burnley & Trowbridge. The finished vest. Please do click on these and all the photos to enlarge them to full size. 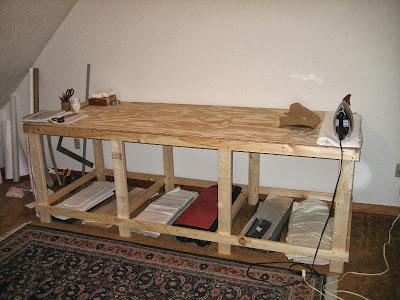 I just need some more wood for lower shelves, instead of putting the cloth on the floor. 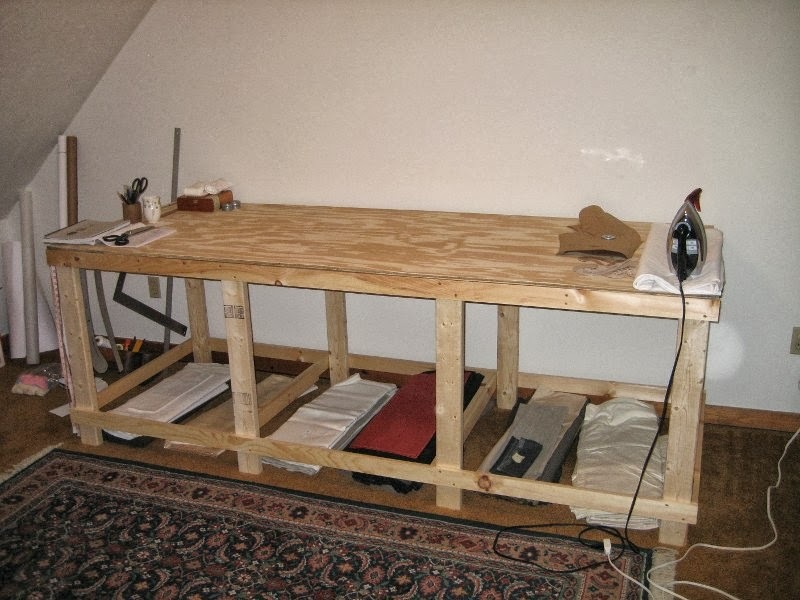 It's the perfect height for drafting, and not too hard to sit on. Anyway, after the research from the last post I decided to make the vest from buff broadcloth, with a red polished cotton back and lining, and ties to cinch it in back. 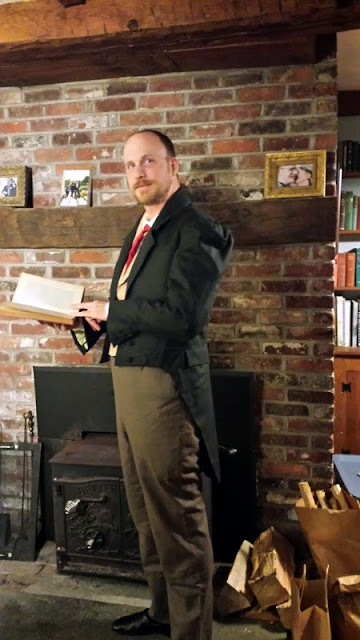 I used the "Single-breasted roll-collar waistcoat, 1830s-1840s" draft from R.I. Davis' Men's Garments 1830-1900. You can see where I'm going to add padding in the chest lining. 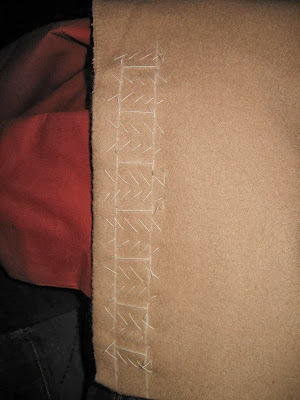 I also wasn't sold on what kind of cinching I was going to use, and you can see two different tab ideas for lacing. 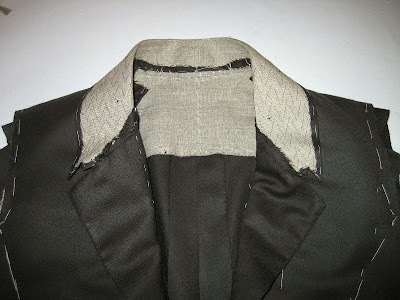 In the end I won't use either of these methods, instead attaching cotton tape to the back as ties. The back pieces, in red polished cotton (ordered from Payless Fabric). 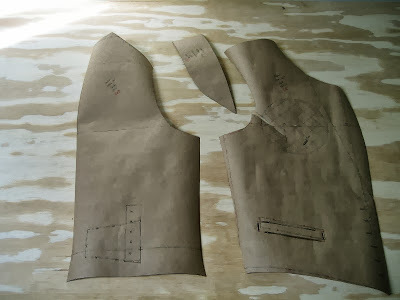 The back pattern piece is cut in two double pieces, for the inside and outside backs. 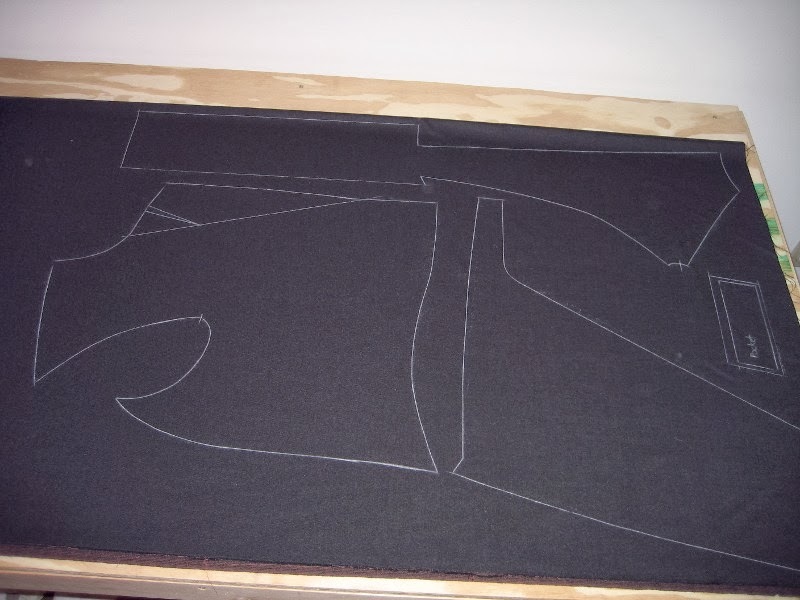 I used the front piece as a template to cut the canvas for the fronts. 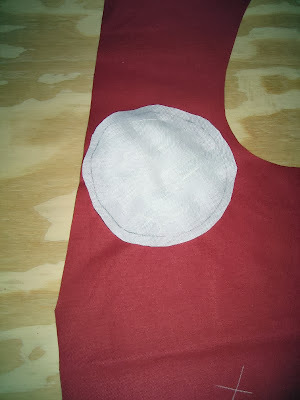 In this case since the broadcloth is already pretty heavy I used cotton muslin for the canvas, cut on the bias. The pockets are done in the same way as I've done before. 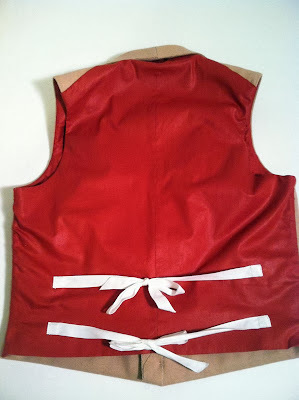 Here I've added the collar extension, basted in the canvas, and basted in the edge tape. 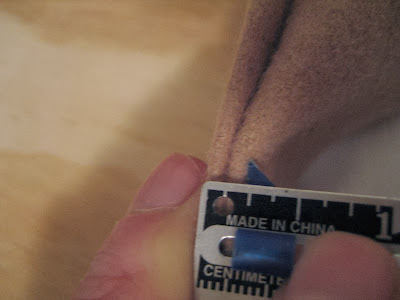 The tape for the collar roll line is basted in tight, to help keep the collar against the chest. The bottom edge is turned up, and creates its own facing to attach the lining to. The edge of the button extension turned over and cross stitched to the canvas. Now I discover a problem. 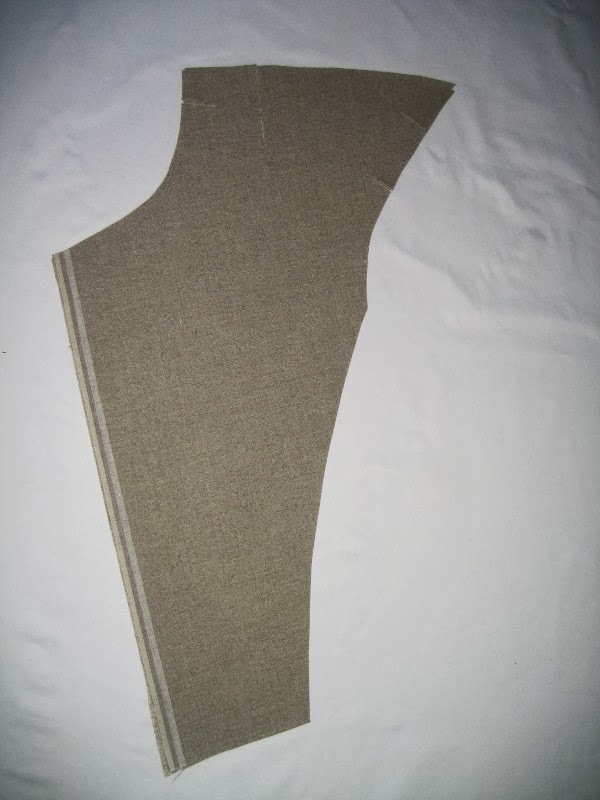 This broadcloth is thick. It's about 1/16" thick on its own. 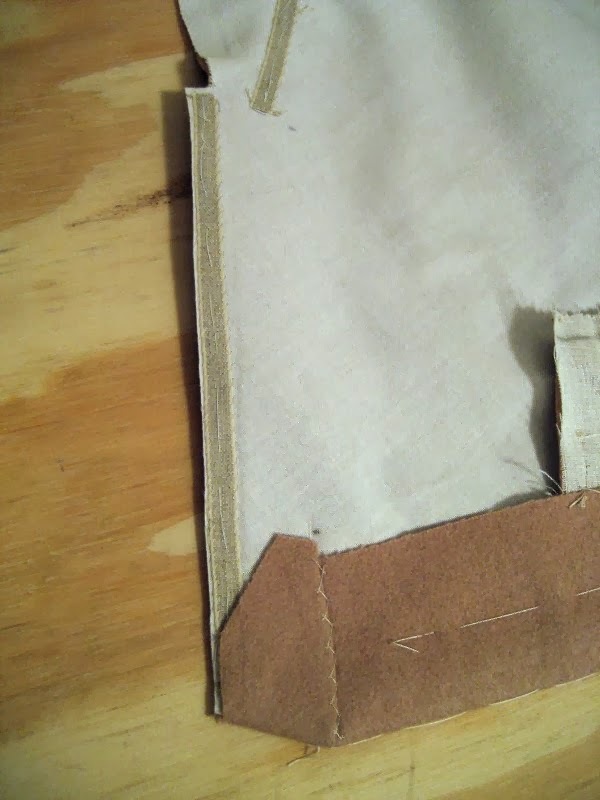 Fold that over, and add a folded over facing, and I'm looking at a front edge that's 1/4" thick! I was worried that this might happen (but not worried enough that I took steps to fix it ahead of time). 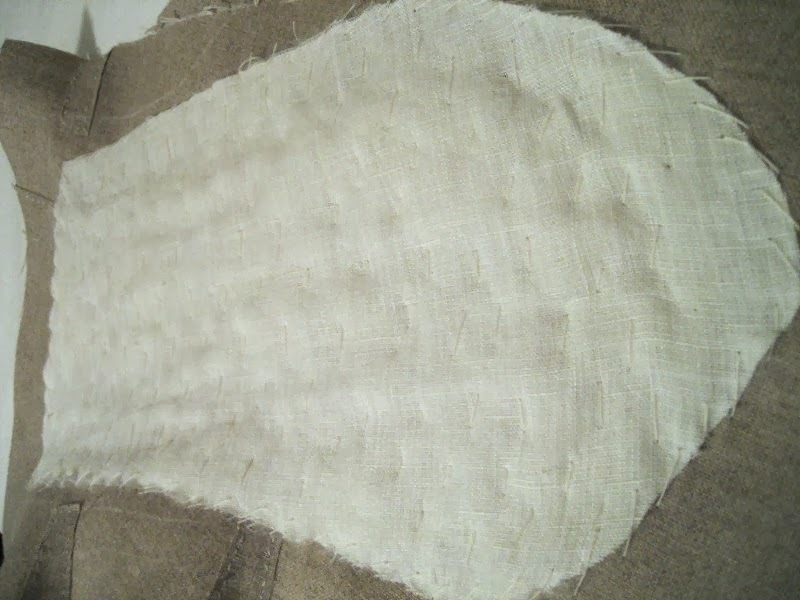 Enter the beauty of broadcloth - because it's tightly-woven and then felted, you can use a raw edge and not worry about it fraying. 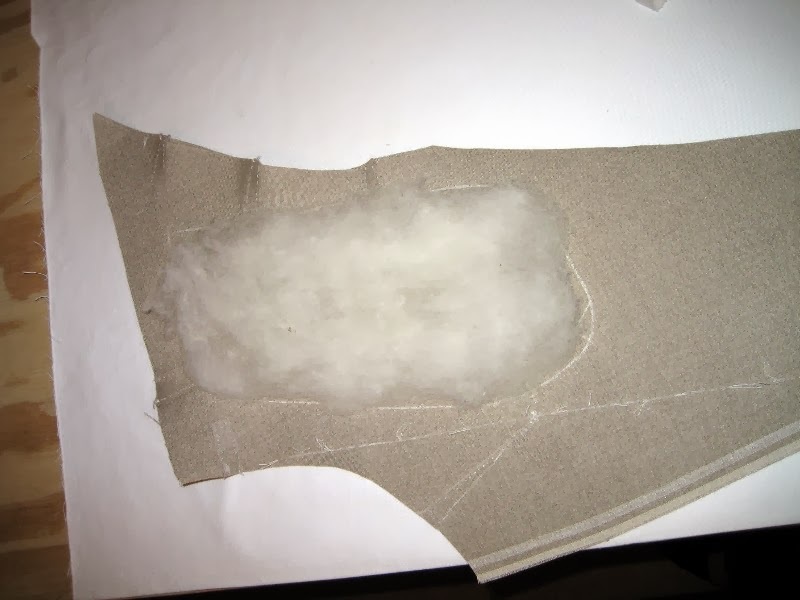 This was actually common with period clothing, and I've seen examples of this in person (I don't have any photos though). I cut off the turn-over of the button extension, and trimmed 1/4" (the seam allowances) off the collar and facing edges. 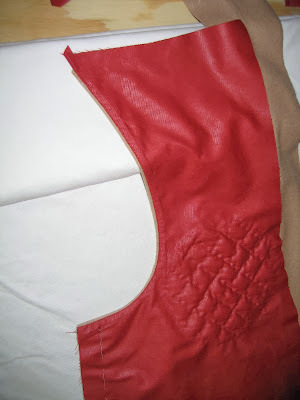 This isn't too pretty where I've already stitched on the edge tape, but I'm not going to take it off. 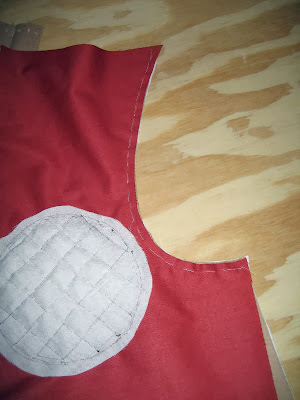 This edge will be underneath the buttoned-up front so I'm not worried about catching a glimpse of the canvas. 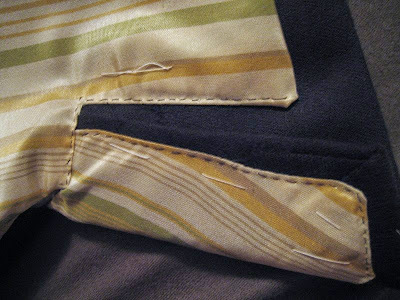 The buttonhole-side I hadn't done yet, so I trimmed the canvas back before I stitched on the edge tape for that piece. I basted the facing in place. In the front where it buttons, the facing is just behind the front, and then shifts to be just ahead of the undercollar. Does that make sense? 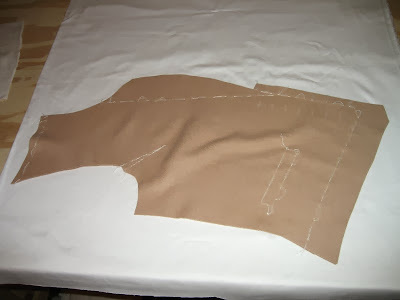 That way, the pieces that will be showing are overlapping the pieces that won't. After felling the facing in place you can see how it wants to lie - it's not flat. This will (hopefully) form around my chest and neck. Success! After felling the total thickness of the front edge is just over 1/16". That will increase my page views, I'm sure. 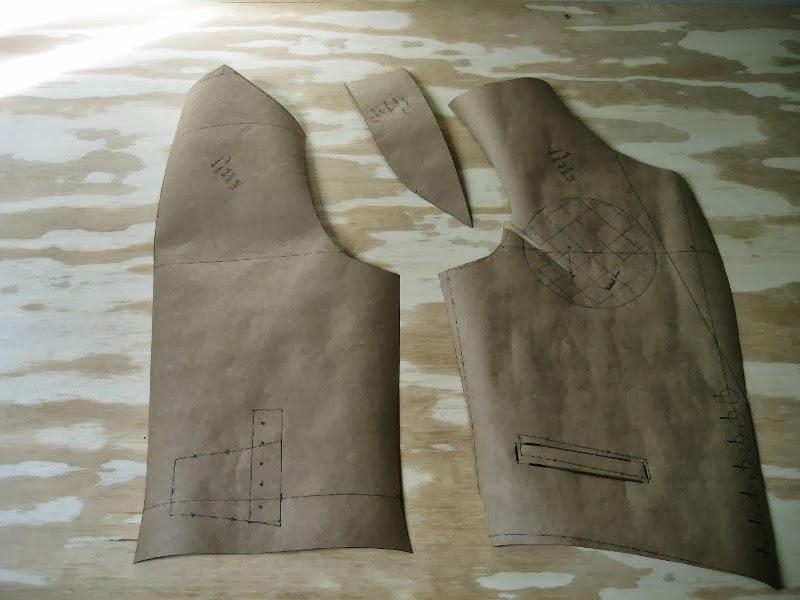 But I'm making a vest in the American sense. 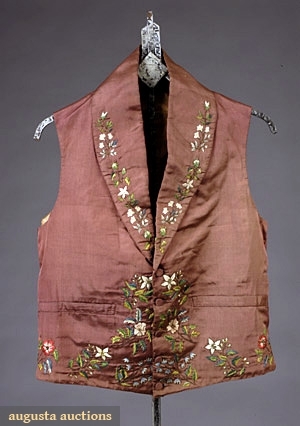 Most of the images I can find online of 1830s vests are pretty fancy silk affairs. 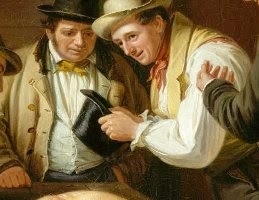 They all have shawl collars. 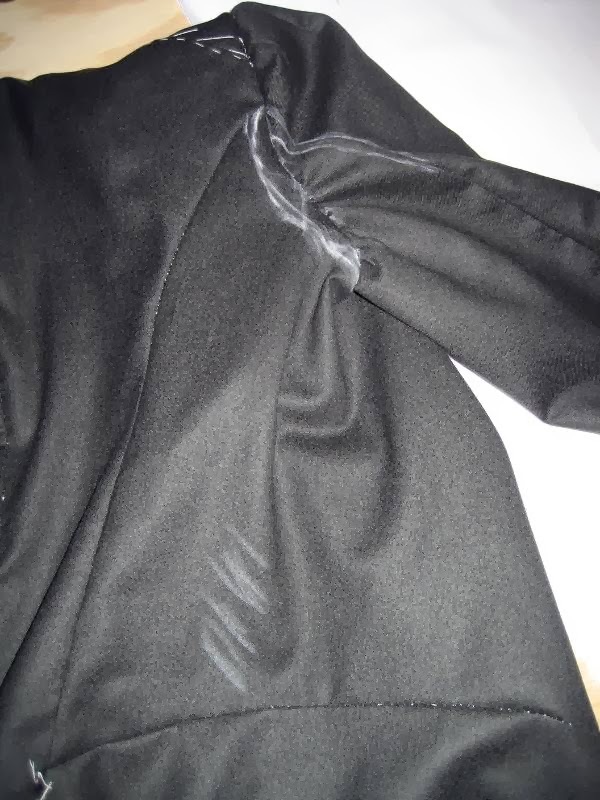 The backs are polished cotton. 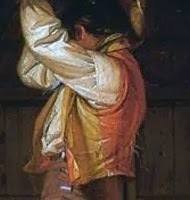 You can see that there are two different methods of cinching the back - ties and laces. 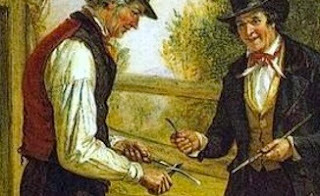 Now I'll turn to my friend, William Sidney Mount. 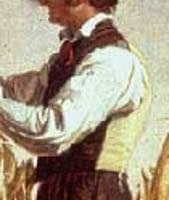 There are plenty of vests depicted in his paintings. Most of them are shawl collars, though there are one or two notch collars. All but one that I can see are single-breasted, and many have red backs. Quite often they are black, but it seems that when they're shown with a black coat, they tend to be buff. 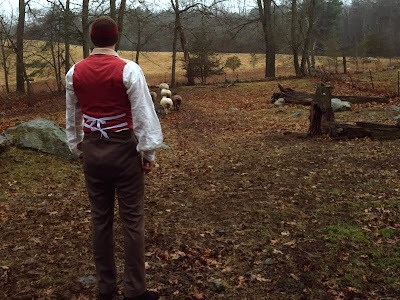 They're all cinched with ties, when shown. The one that you an see inside is lined with the same polished red cotton as the back. They all come to a shallow point at the front waist. You can see the red lining above right. 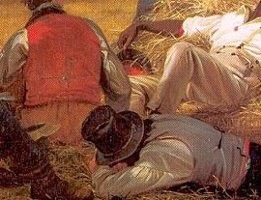 Hey look - different paintings, but the two men on the left above seem to be the same! 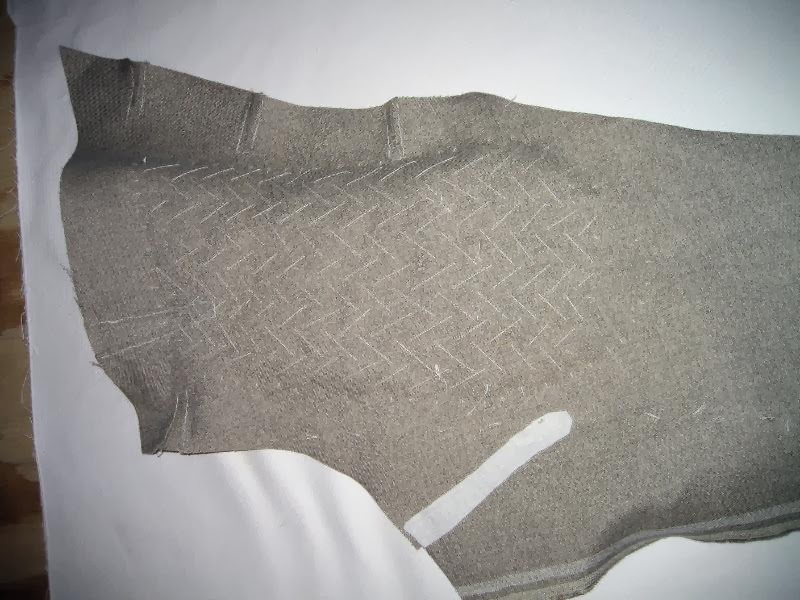 A hint of white lining. 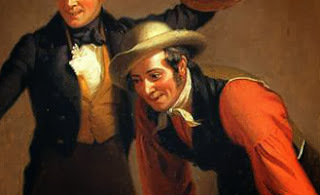 This is also, I think, the only figure painted by Mount who isn't wearing a white shirt. 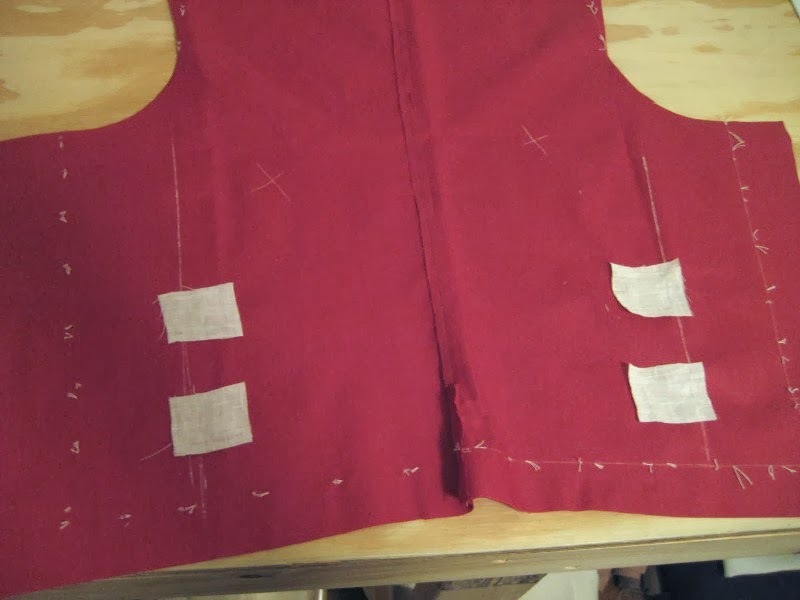 Next time I'll start work on the vest itself.